He gemmed those troops too, wow. How many did you end up getting off him? What troop levels does Tmed become viable? What's most important is two landing crafts of medics and then making sure the rest the landing crafts can hold two tanks. They are viable from the get go like that. Unrelated, hammersmith are you still playing this game? I find gun boat energy to be critically important. I now have three GBE statues, which will let me artillery/barrage a boom cannon and two other cannons. Then I just look for bases that will let me get to the HQ under those circumstances. You can shock/flare normal cannons if necessary as well. Boom cannons will one shot tanks, which is an expensive and lengthy downtime, thus must be avoided by any means. The attacking is my favorite part. Scouting to figure out the ranges of deadly defenses, then using flares to avoid them, is a puzzle. I love puzzles. Tmed works out of the gate, the bases you can take depend on your gbe/arty/barrage and a lesser amount shock. 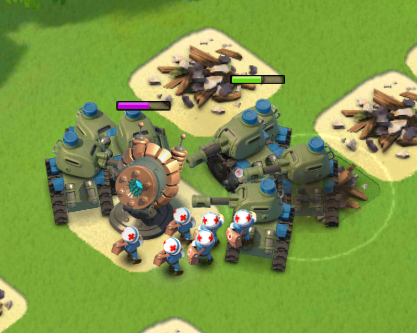 Once you get your tank hp up, with a third boat of medics you can safely ignore sniper towers for a long time before they actually threaten tanks. Just got 7 big purple crystals I wanna spend, but am wondering: Is there any way to predict what type of statue bonus you'll be getting? If it makes any difference, my last three dark statues (in order) were GBE, GBE, and RR. Additionally, my dark masterpieces were RR and RR. Took so long to get 'em. Wanna do this right, if I can. 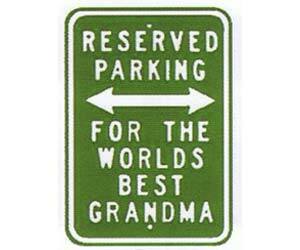 I'm hoping for either GBE or PSC. AFAIK they are completely random, just roll the dice and hope for the best... Good luck! Someone spent a lot of money .. Unrelated: is there any reason not to immediately use power stones to build totems if you have enough? I imagine you can't save them up to produce bigger ones? Just applied to goonfleet under this name. What are the downsides to beaching your HQ and purposefully dropping VP? 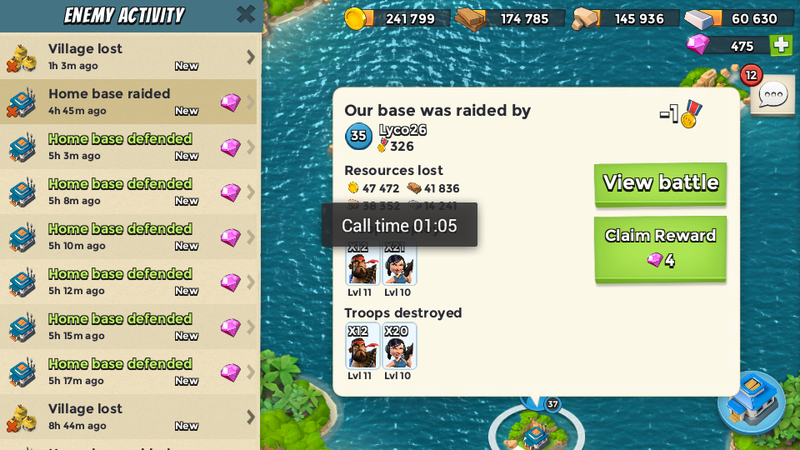 As far as I can tell, as long as you're smart about when you collect resources you shouldn't have much of anything to be taken in a raid, and the only loss is the VP boat. The potential benefits are getting a lot of much easier PVP bases to attack. I haven't tested it but just theorycrafting it could be very beneficial as long as you're only raiding enough to do get your upgrades moving (i.e. never stashing a lot of resources). Higher level bases usually have better rewards sure but lower level ones are a lot easier to attack and do so without many losses. Just theorycrafting I would think a good cycle would be beach your HQ to let your VP drop. Meanwhile, log in whenever an upgrade is necessary, do a bunch of (comparatively easy) raiding to fund it, and repeat. I seem to get 4 medium crystals as my daily VP reward every other day or so with 450+ VP, so maybe some of the 500+ guys can weigh in. I figure there's always going to be multiple people stronger than me cycling through my base, so I'd rather make em work for it. Plus all the free crystals. What are the downsides to beaching your HQ and purposefully dropping VP? I've toyed with this a little recently. You really have to have almost no resources, because the vault's 100% protection cap is extremely low and if you're going to be getting hit often enough to make this work, anything above that is going to be gone. Does it eat the OP boat? If so you'd have to be careful when you time it. When I've put it out there, I get hit maybe once every two days. 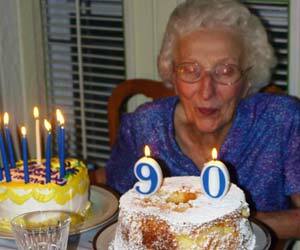 Not really enough to make it worthwhile. Maybe if you built up a huge surplus and held it for long enough that you spawned on a bunch of maps with a huge pile of resources enticing people to drop you, it would work better. But at that point you're just playing the game backwards. SuperCell seems to have learned from the TH outside free shields in Clash. By all means try it, and let us know how it works. For me it just seems like way more work than it's worth. Once your medal count gets high enough, people will start rolling you and you'll lose medals naturally. Might work if you're taking a long break from the game though. At ~625 VP I get 6 medium crystals from the VP reward. 500 is still 4 crystals, but people start having 200k gold all the time you press next so it's a fair trade. I'm level 27 at 220 VP and I get paired against level 39s. Raiding has stopped pretty much, so I'll be stockpiling resources so that I am raided to drop down. It's all dependent on your VPs comparative to your level. Need more goons in Patton's Heroes! Do you mind complete scrubs? The Boat Pirates welcome scrubs with open arms! But on that note, I'm not sure it makes sense to keep splitting ourselves into 2 task forces since there isn't a steady stream of new players joining up. We're 10 goons strong and Patton's Heroes are 11 strong. Wouldn't it make sense to combine our forces? In the OP it says resources are not vulnerable until collected. Is this true? I can't find a straight answer on it. Seems most people agree the boats are safe but what about unclicked resource collectors? Part of the reason there's confusion about this is that the dropdown only counts what's been collected. Potentially more is vulnerable than what that dropdown would lead you to believe. They did a quick test on the sc forums and 50% of resources not collected are vulnerable regardless of vault level.. Not including boats. Sent a request to Patton's Heroes. I rolled a 16% RR statue, but I'm not sure what to replace. 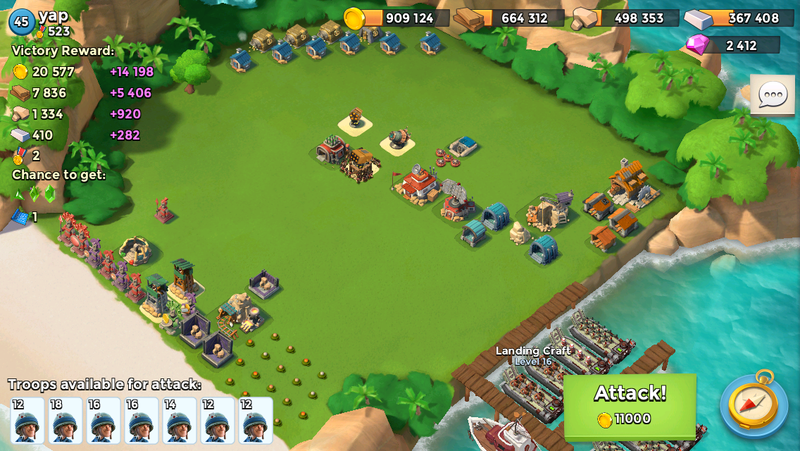 I have mostly offensive statues, three GBE, two troop damage, and one troop health. The only one not offensively oriented is a 15% building health statue. That's a pretty middling RR statue. Maybe one of the GBEs? 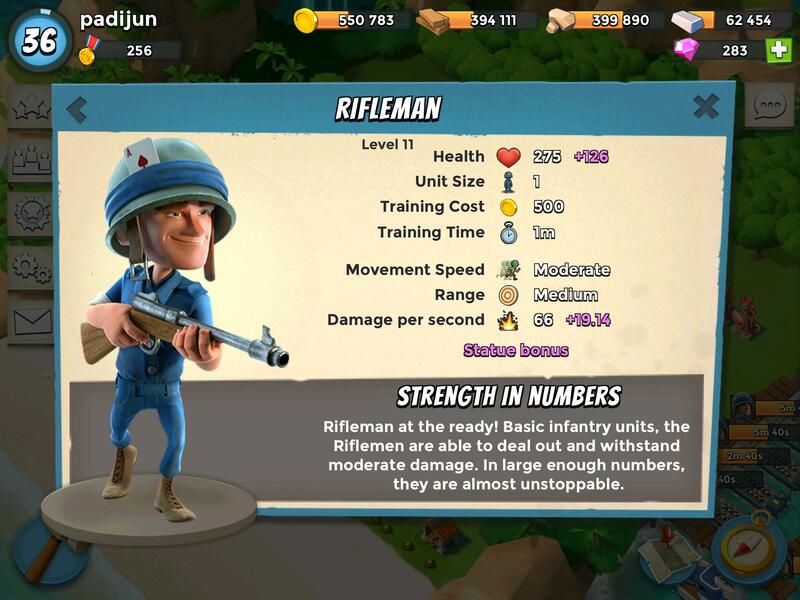 All riflemen is my favorite. So cheap and versatile. I might lose 50 troops, but the 30 left standing are more than enough to destroy the HQ. e: just gemmed the last 200 I needed for sculptor 5, then I get to plop down my 14% building damage statue and get back to upgrading all my defenses.